Despite appearances, this spiky creature was not lovingly crafted by Hieronymus Bosch. Instead it is a real animal–a lowland streaked tenrec (Hemicentetes semispinosus) which is a native of the wandering micro-continent of Madagascar (presently located off the east coast of Africa). The little tenrec weighs only 200 grams (7 ounces) and measures 13-17 cm (5-6.5 inches) from the tip of its pointy bewhiskered snout to the end of its vestigial tail. 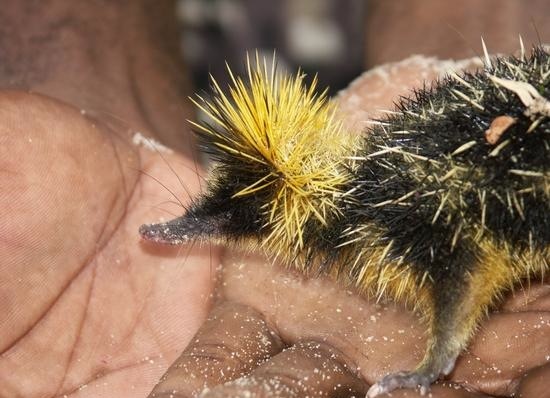 The yellow-and-black creature is covered with scattered quills (some of which it can detach at will). The little animal lives in the eastern coastal rainforest where it subsists primarily on worms and small arthropods. It is active both by night and day. But perhaps you are asking just what a tenrec is to begin with (my word processor, for example, obdurately refuses to recognize the word). The tenrecs are a group of omnivorous (though largely insectivorous) mammals which live throughout Madagascar and sub-Saharan Africa. They seem to be descended from some basal line of edentate mammals—as evidenced by their low body temperature and by the fact that they have a cloaca (a multi-purpose orifice for excretion and reproduction). Across their range tenrecs evolved to fill many different ecological niches. Thanks to convergent evolution, various species of tenrecs look like mammals more familiar to us such as otters, opossums, rats, and shrews (the lowland streaked tenrec, for example, appears analogous with the insectivorous hedgehog) but these appearances are superficial. Tenrecs seem to be distantly related to other African mammals like elephant shrews, sirenians, and hyraxes. Their only close relatives seem to be the extraordinary golden moles (like Grant’s golden mole, the exquisite sand swimmer of the Namib Desert). 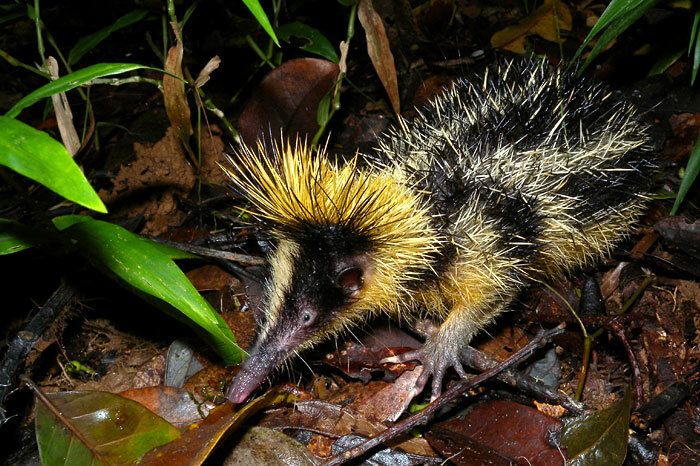 As you might expect the lowland streaked tenrec utilizes its quills to deter predators—namely the disquieting fossa and various other carnivorous Malagasy mongooses. 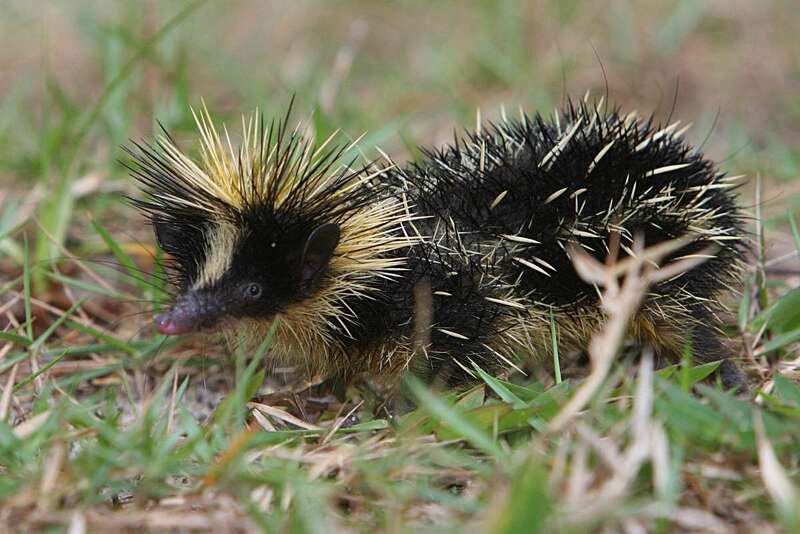 The tenrec can pivot the barbed spikes on its back and neck into an upright crest. Thus armed, the colorful little animal charges boldly at predators–which must perforce retreat or contend with a face full of barbed spikes. The lowland streaked tenrec is also unique among mammals in that it uses its spines for stridulation—a violin-style method of producing sounds to communicate. Like a cricket, the lowland streaked tenrec vibrates its quills together to make a strange shivering chatter (useful for finding mates and communicating in groups). You can hear the strange noise in the peculiar Youtube video below. Female tenrecs mature quickly and can reproduce in as few as 25 days after they are born. They give birth to litters of 3 to 7 young.